Fallbrook, Bonsall, Vista, Oceanside and Camp Pendleton are communities that are either affected or in the fire's path, Cal Fire officials said. 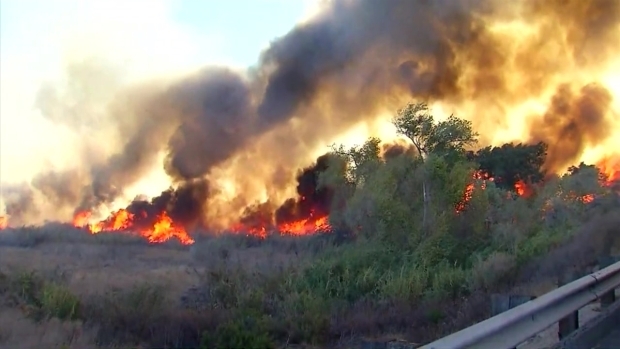 A brush fire that sparked alongside a highway interchange that took off in extreme fire conditions Thursday, scorching thousands of acres in Fallbrook and Bonsall is heading toward the more populated community of Oceanside and Camp Pendleton. The Lilac Fire, as it's been named by Cal Fire officials, is burning out of control and has burned 4,100 acres since it sparked just after 11 a.m. Officials say 5,000 structures are threatened. Flames marched through parts of Fallbrook and Bonsall, burning homes and ranch properties to the ground. A mobile home park in Bonsall was devastated by the Lilac Fire as it broke out and quickly spread west Thursday. NBC 7’s Dave Summers reports from the Rancho Monserate County Club. New mandatory evacuations have been issued as the fire moved west toward the cities of Oceanside and Camp Pendleton. "Tonight is one of those nights, today is one of these fires," said Cal Fire Division Chief Nick Schuler. "This fire could make it all the way to Oceanside to the coast if it continues." State Route 76 is closed in both directions at North Santa Fe and Melrose eastward. Eastbound traffic on North River Road at Leon is closed. NBC 7's Alex Presha is in Bonsall, speaking to one family packing up their vehicle as the Lilac Fire continued to ravage the area. Northerly winds pushed embers to the area north of SR-76 at Olive Hill Road. Helicopters were making night water drops and a bulldozer was working to cut a fire break. As of 7 p.m., winds were 20 to 25 mph with gusts up to 35 to 40 mph. "They're blowing in all kinds of directions," said NBC 7 weather anchor Llarisa Abreu. Two civilians suffered burns in the fire and were transported to area hospitals to be treated, Cal Fire officials said. It was unclear how the injuries occurred. A San Diego County Sheriff's Department deputy suffered minor injuries while directing traffic. At the time of the incident, visibility in the area was low due to thick clouds of smoke. It was not clear if it was a factor in the injury. 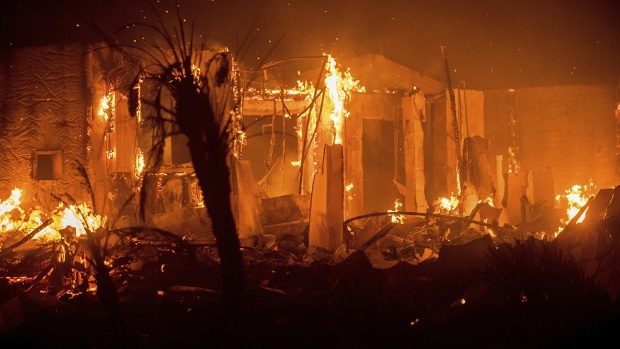 Twenty structures were destroyed and 12 structures were damaged by a fire that officials said was spreading at a dangerous rate. However, the total number of structures lost could be much greater. 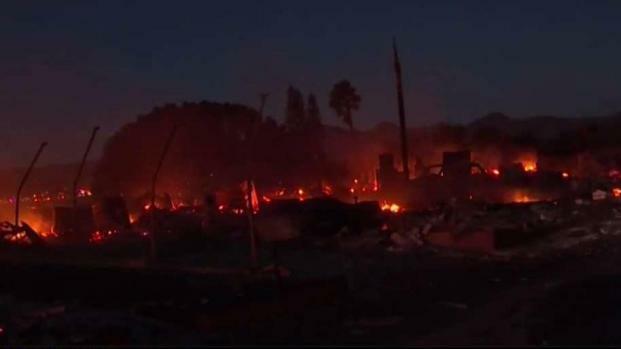 In the Rancho Monserate Mobile Home Park, at least 40 units were destroyed, according to an NBC 7 news crew. Several more homes were damaged. One Bonsall resident said it was like nothing he had ever seen before. "It looked very eerie, very dark and overcast. It's almost like driving into Hell," Jerry Vasquez, who lives off West Lilac Road said. Vasquez said he could see three or four homes burning as he evacuated. Horses could be seen running in circles as firefighters opened homes' gates to free them. Hundreds of horses were loose south of State Route 76 on Camino Del Rey, CHP officers confirmed. California Gov. Jerry Brown declared a state of emergency for San Diego County Thursday, freeing up federal resources as crews battle the fast-moving blaze. The county had declared a state of emergency earlier in the day. The fire, first reported at 11:20 a.m., prompted a SigAlert on southbound I-15 causing delays until all lanes were reopened as of 1:10 p.m. California Highway Patrol closed the off-ramp from I-15 to Old Highway 395, but it was reopened just before 2:15 p.m. Here are the road closures as of 7:00 p.m.
More than 23,000 San Diego County residents received evacuation alerts from San Diego County. A full list of the latest evacuations and closures can be found here. The smoke was so thick, it was blocking out the sun for a while, according to an NBC 7 news crew. Embers scorched some landscaping at Sullivan Middle School but the campus looked like a ghost town. Fire crews were walking around the school putting out hotspots. "It was pretty wild. We saw the smoke clouds; everyone was a little frazzled," the tutor said. "Students were all worried about their homes and their families." Cal State San Marcos sent a message to student and staff saying no assignments or tests will be due during the campus closure. Palomar Community College District will be closed and classes canceled Thursday evening and Friday all day and evening. Sites at Camp Pendleton, Fallbrook and Mt. Carmel will be closed. MiraCosta College was also closed. An overnight shelter was set up for residents at the East Valley Community Center on 2245 E. Valley Parkway in Escondido. 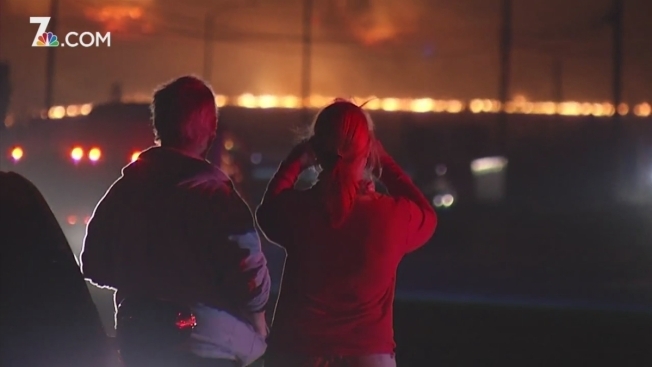 Temporary evacuation shelters have also been set up at Great Oak High School on Deer Hollow Way starting at 6 p.m. Fallbrook High School was initially used as a shelter site but was later closed to evacuees. Stagecoach Community Center and Oceanside High School were at capacity as of 11 p.m. Evacuees should head to East Valley Community Center in Escondido, 2245 East Valley Parkway. The Del Mar Fairgrounds and the San Diego Polo Fields in Del Mar opened up their grounds for large animal evacuations. 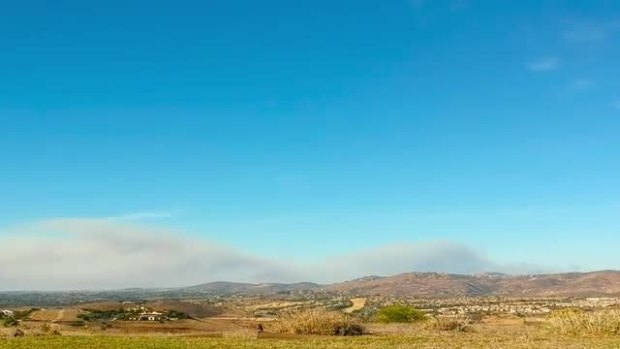 The risk of a wildfire in San Diego County is extreme Thursday due to Santa Ana conditions and dry vegetation, according to the National Weather Service, the U.S. Forest Service and the NBC 7 weather team. Humidity will be in the 5-15 percent range, according to the U.S. Forest Service. Any new fires will have a high probability of becoming large in a short period of time. Under the high wind warning, in effect until 4 p.m. Friday, forecasters expect the strongest winds after daybreak morning through early afternoon Thursday. A fire weather warning is in effect until 8 p.m. Sunday and means any fires that develop will spread rapidly and be very difficult to control. Wind gusts in the area of the fire were recorded from a northeast direction as strong as 51 mph on Highway 76 in Pala, according to the National Weather Service. The winds along I-15 near the fire were recorded at 30 to 35 mph. The county was reminding people seeking information about the fire to call 211 and that 911 should only be used for emergency situations. Time Lapse of Lilac Fire from 1PM-2PM - as seen from Black Mountain area looking North. Strong winds and dry conditions fueled the fast-moving Lilac Fire in San Diego's North County Thursday.